Mid March to Mid October. One brood emerges in June or July. 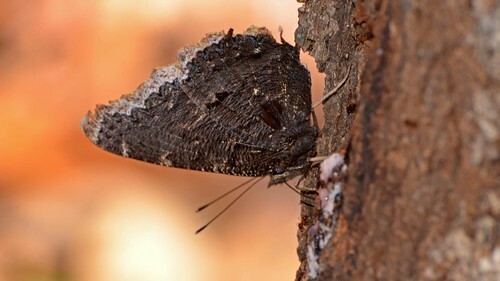 This is a large, dark, brushfooted butterfly. It has a wingspan of 2¼″ to 4″. Young butterflies are reddish-brown above with a wide yellow border at the outer margin and conspicuous, iridescent blue submarginal spots. 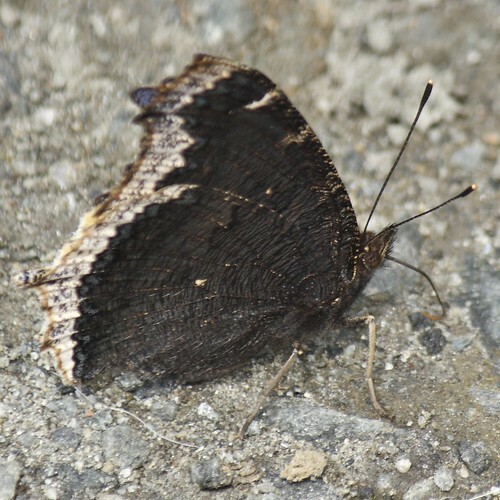 The underside is dark, striated brown with a wide white border at the outer margin. Older individuals in May and June are dark brown above with a wide cream to yellow border at the outer margin and less conspicuous submarginal spots. 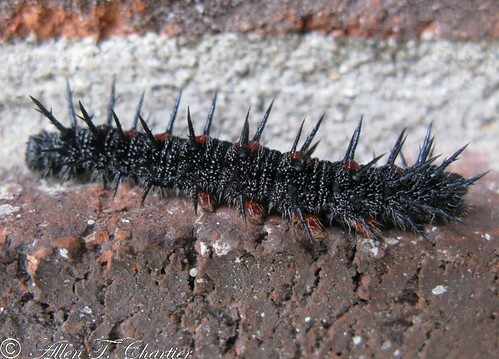 The caterpillar is black with much white flecking, a narrow black line down the center, 2 rows of red spots, and numerous long, shiny, black spines. Young leaves of mostly willow, but also plains cottonwood (Populus deltoides var. molinifera), quaking aspen (Populus tremuloides), American elm (Ulmus americana), paper birch (Betula papyrifera var. papyrifera), and northern hackberry (Celtis occidentalis). Mostly oak and maple sap, but also other tree sap, rotting fruit, and occasionally flower nectar. Often found at sapsucker holes in the spring. This is usually the first butterfly seen in the spring because most adults overwinter. It is also one of the longest lived butterflies in Minnesota, living up to 10 months. Caterpillars live in a communal web. After the new brood emerges in June or July they enter a period of dormancy (aestivate) similar to hibernation. They fly again in September and October. Most adults hibernate in the winter in hollow logs, wood piles, and loose bark. Some adults migrate south in the fall. A period of reduced metabolic activity in the summer, similar to hibernation. The flight of the Camberwell beauty (Nymphalis antiopa). An extract of a documentary about the Camberwell beauty (Nymphalis antiopa). Discover the life-cycle of this magnificent and difficult butterfly to approach. All the different states of the cycle have been filmed, from the hatching of the egg up to the transformation into a chrysalis and finally the liberation of the butterfly itself in fabulous natural scenery. I was finally able to see the final stage in the Butterflies life. They were stunning creatures and they let me handle them before they flew off to start thier lives. Pics at the end of vid. A special treat is in store for you as you witness Mourning Cloak Caterpillars dance to Indian flute jazz. 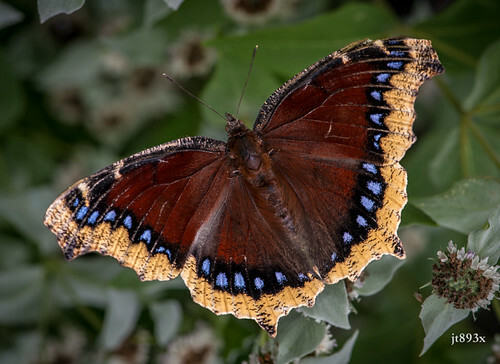 Mourning Cloak (Nymphalis antiopa) is easy to identify because of its unique wing markings. The distribution of this species is covering almost all over Eurasia and North America. In Japan this species is confined to the mountains. It appears from middle August when other butterflies have already been worn. Flight is swift and glaceful. It rarely visits flowers, it is usually attracted by tree sap, rotten fruits or animal droppings. This species hibernate as an adult butterfly. In May or June worn butterflies with their wing edge in white are seen. Observed adult sitting in leaf litter in open woodland on the north side of the nature center. Temperature in mid 60’s and sunny. I was in my backyard today and saw this butterfly sunning itself. Beautiful. Didn't know what it was until I looked it up. Will it survive our cold and snowy Spring? Good question. The next day it snowed. JG saw an early one on March 22, 2016 (below). I don't know what the weather was like that year. I have been seeing these in our neighbor hood all summer. We live in a swampy area with a lot of oak, popples, and willow trees. Hello: I have one of these in a cocoon on my deck railing. Looking forward to watching it hatch. Saw it cruising through the baseball infield at Hiawatha Park in Minneapolis. While researching what was eating my willow tree's I seen this email. I had a quite large infestation of these yesterday. Thought you might want to add douglas county as your sighting list.